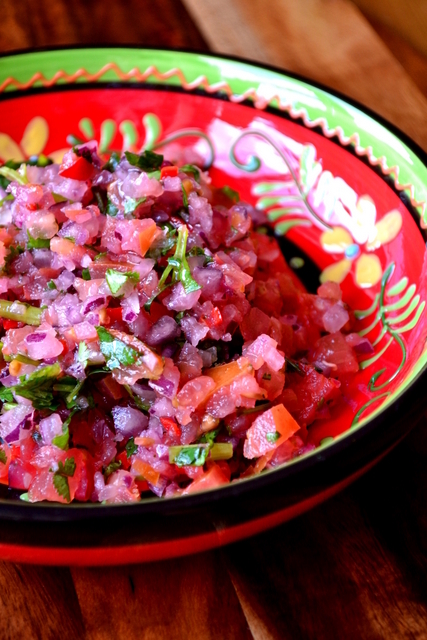 Though never the main event of a meal, salsa is always a great garnish to have to hand. It freshens, lightens and complements flavours. From barbecues to curries, salsa is a must-make side-dish. Everyone has their own recipe, of course, but there’s no harm in sampling something new and a little different. 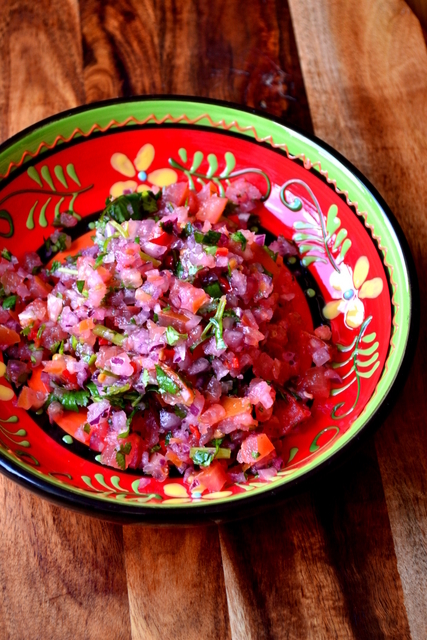 Here’s my recipe for Tomato and Red Onion Salsa. In my mind, a good salsa should be a perfect balance between spicy, sweet, savoury and fresh. Sweetness is perhaps the most difficult area to get right – some people even add sugar. But, it’s best to keep things natural, using just the right balance of ingredients. Because salsa recipes are so simple, there are a few measures you can take to make sure your rendition will be exceptional. Firstly, sniff your tomatoes. Tomatoes should really smell like tomatoes. Giving them a squeeze tells you nothing – sniff them. You’ll know when you’ve found the right bunch. Secondly, finely chop everything. There’s nothing worse than a chunky, clunky salsa that doesn’t quite absorb the flavour of the lime juice. 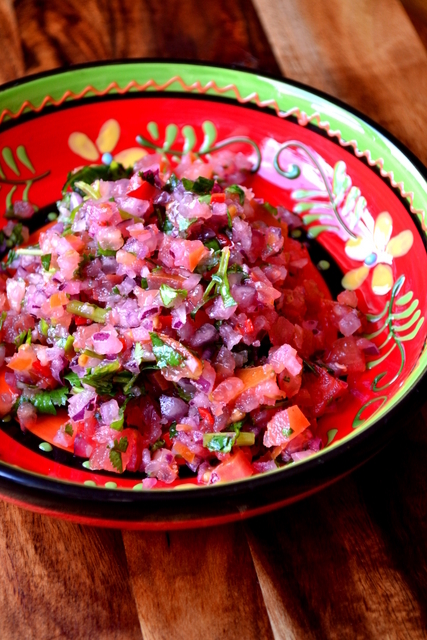 A puddle of lime juice is not what you want at the bottom of a bowl of tomato and red onion salsa. Finally, use the coriander stems. So many chefs tell you to avoid these, but they are jam packed full of flavour. Yes, they aren’t pleasant to chew on, but if finely chopped you’ll never notice! It’s such a waste to throw them away. In fact, I prefer them to the leaves. Now, go and enjoy your salsa! Roughly chop the onion, tomatoes, coriander and chillies together on a chopping board. Place the blunt edge of the knife in your palm, rocking it back and forth over the ingredients until very finely chopped. Mix together the lime juice and salt in a bowl, before adding the chopped ingredients. Mix together thoroughly before serving. Cost: None of the above mentioned ingredients are particularly expensive and in a salsa recipe will certainly go a long way. Indeed, the entire bowl – enough to feed at least 4 – should set you back no more than £1.10. This looks great! I love the dish you served it in as well. Have you ever tried making salsa with tomatillos (salsa verde)? I love Mexican cooking and trying out different salsa recipes. Thank you, it’s all the way from Spain. If I see some tomatillos I’ll certainly pick some up! I’ll keep my eyes peeled! What a great salsa, like the fact that you chopped everything so small. Beautiful dish! I hate having big pieces of onion etc in your mouth – it just isn’t pleasant. Plus, the flavours work better. Thank you very much! That sounds lovely.